T-Tech is another innovative new product designed and manufactured by STL Enterprises. The president of STL who is an avid golfer who found his biggest problem of his game was never being able to consistently hit the green. He designed the T-Tech product as a way to improve his game and lower his score. After seeing a golf professional, he realized that his biggest problem was that he simply was misaligning to the target. Although his teacher had him lay down a club to help his alignment, he was never able to get a true concept of where his alignment problems were, so he could correct them. Since designing the T-Tech, he has taken 10 strokes from his game. Not only has his tee to green game improved, but also one of the greatest improvements has been his putting. The T-Tech has worked as well for his putting as it does for the rest of his clubs and game. What really shocked him since the introduction of the T-Tech, is how many people it has helped. The first thing he is told about the product, is how it is one of the best overall game improvement tools they have used. People are ecstatic about how the T-Tech has given them a better concept of where their body, club and ball should be to the target. 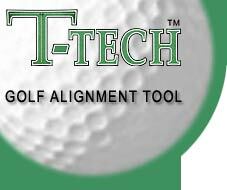 The T-Tech has proven to be a great game improvement tool and there's no doubt that any golfer will improve their game and lower their score using the T-Tech golf alignment tool. "Remember the greatest swing in the world; won't score if it's misaligned"